I swear that motorcycles know when they’re dirty. Perhaps it’s my imagination but after a good clean and polish they seem to perform better. Are they saying thank you? Cleaning isn’t just for looks. Motorcycles will last longer when dirt and grime doesn’t corrode parts or deteriorate bodywork. A clean and well-maintained bike will also hold its resale value. 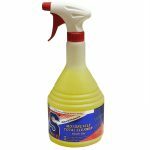 SDoc100 Motorcycle Gel Cleaner is a great cleaning all-rounder if not a near one-stop-shop. Sometimes you really need to access those hard-to-get-to areas where the real grease and grime sits. The Muc-Off 5 x Brush Set will get to those areas without damaging the surfaces. Do all the washing and shampooing stuff first. That takes away the surface dirt, mud or grime. It’s hard to polish a bike that’s already caked in dirt. The heavy-duty dirt removal from chains, sprockets, spokes and wheels should also come before more sensitive cleaning and polishing. Wash your bike from top to bottom using a soft cloth or special brushes (see below). Sponges can pick up grit or dirt that could scratch your bike. N.B. 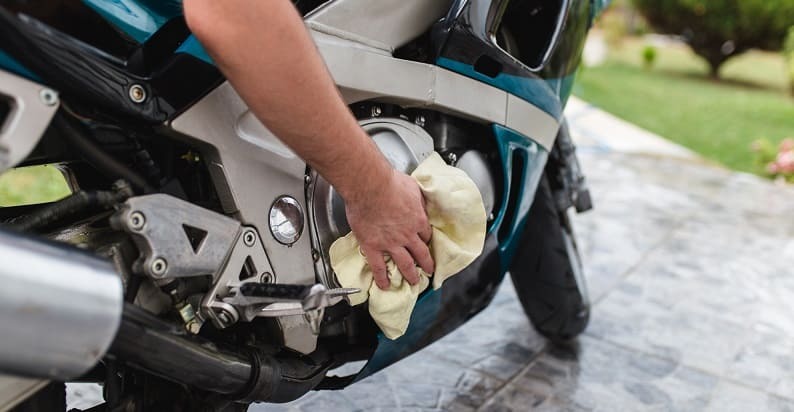 Keep an eye on the condition of your motorcycle chain and oil if necessary, and remember never to apply any treatment to the tread of your motorcycle tires. After all the cleaning and polishing work has been done then take the bike for a careful ride. Chances are that a few water pockets exist. A light ride will flush them out and also allow the brakes to be tested at low speeds. It’s possible that cleaning material or water may have entered the system and softened them out. Cleaning a bike thoroughly offers a great opportunity to inspect the bike. This attention to detail allows you a close look at each area where you can spot if anything is out of place or doesn’t look quite right. Let’s have a look at our top five products. 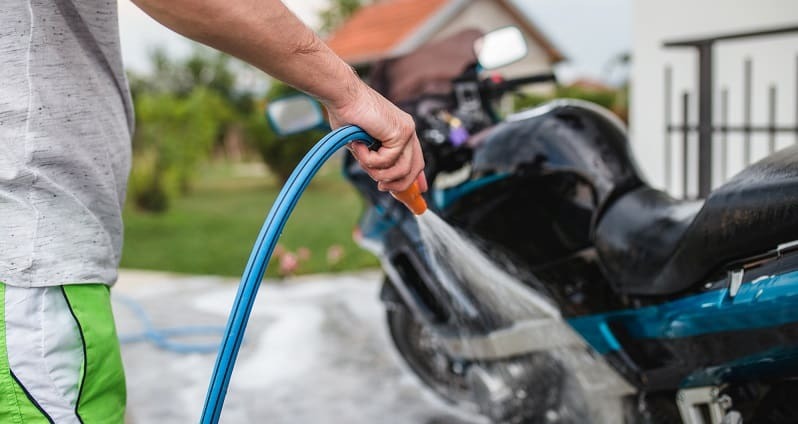 A big concern when cleaning your motorcycle is gaining access to those tricky areas and also to avoid damage with aggressive brushing or wiping. This unique gel formula may be the solution. The SDoc 100’s adhesive properties allow it to stick to the surfaces and work on the dirt. Other more liquid-based sprays may run off before they have a chance to make an impact. Unlike more specific sprays or gels the SDoc 100 is kind to the more sensitive areas and hence suitable for cleaning almost the whole bike. 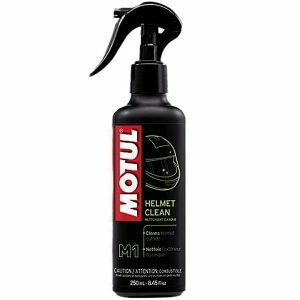 The Motul M1 helmet and visor cleaner isn’t a big bottle but with accurate and effective use it’ll do the job of cleaning and shining very nicely. Besides, we’re not cleaning a whole bike here just the helmet shell and visor. The size is actually an advantage when keeping the bottle in a pocket or small pouch. Just whip it out, spray your helmet and then put it back again… nice and easy. Despite being a spray it does have a decent viscosity which ensures that the liquid doesn’t run away when applied. 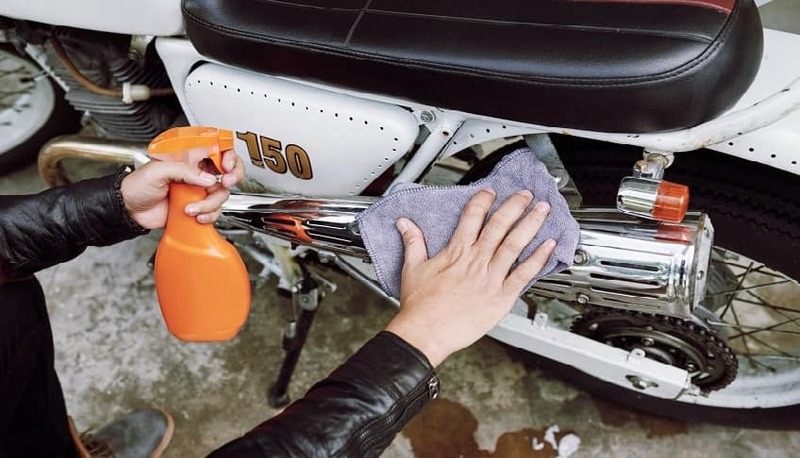 Separating cloths and brushes helps avoid greasy or oily substances from dirtying the more sensitive areas of your motorcycle such as paintwork. 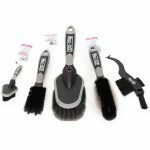 This collection of five brushes allows that separation and greatly enhances access to those difficult to reach locations. The Soft Washing Brush with large-sized head for cleaning bike frame and outside components. The Detailing Brush is a more brutal brush for those difficult to reach sprockets, hubs, suspension mounts and fork crowns. The Claw Brush is a three-headed brush mostly used for accessing all sides of the chain. The Wheel and Component Brush covers all areas of the wheel such as tyres, rims, spokes and centre. The Two Prong Brush is a good all-rounder for hard-to-shift caked in dirt in otherwise inaccessible locations. Fuchs Wash Off is a very easy-to-use cleaner spray for any type of motorcycle. Whether applied to plastics or metals you just spray it on, wait a few minutes and then wash it off with a fresh water hosing. 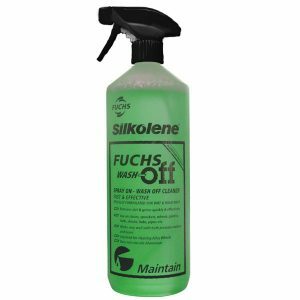 The Fuchs composite detergents allow safe use on unprotected aluminium making it ideal for most areas of your bike. Not quite a one-stop-shop but very close and will leave you bike in near-showroom condition. Finally, after all the spraying and brushing, you can give your bike a polish and shine. 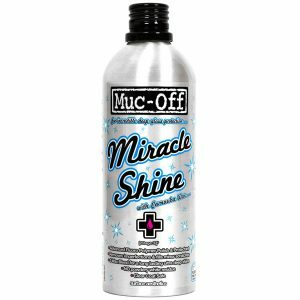 Muc-Off Miracle Shine both polishes and protects through its unique blend of waxes. The Fluoro Polymer Technology provides resistance to water and contaminants keeping grime and heavy dirt at bay. The advantage to you is a longer lasting shine between washes. Rainwater simply slides off the wax layer leaving your paintwork looking like new. A tidy desk is a tidy mind, goes the expression. A clean and polished motorcycle also says a lot about how we regard our bikes. Cleaning a bike can also be fun or even meditative. So, with a mug of coffee, some peace and quiet or background music, immerse yourself in the art of motorcycle cleaning and polishing. When it’s all done, stand back and admire your work. You might even want to ride your bike too!